In the last ten years the number of nonprofits and social sector organizations has grown by almost 25 percent, while charitable giving declined 30 percent over the same period. As a result, many organizations are chasing grants, tweaking and adding to their core activities to match what they think funders are looking for. Almost half of nonprofits surveyed nationally in 2014 said they added additional programs in the last year. The result is colloquially known as "mission creep"-- organizations trying to be everything to everyone. Yet research suggests that the more goals individuals or organizations pursue, the less likely they are to achieve them, leaving these organizations often overwhelmed, underfunded, and unfulfilled. 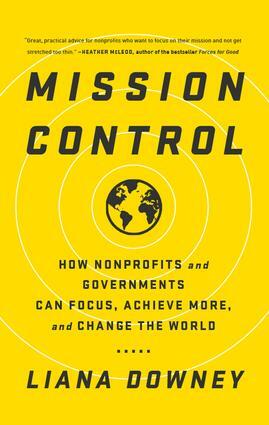 Mission Control: How Nonprofits and Governments Can Focus, Achieve More, and Change the World is designed to restore focus and gain "mission control" to identify the things they should and should not do to drive impact. Drawing from the author's experience of working with thousands of clients at nonprofits and government agencies around the world, both large and small, the book represents the stories of countless mission-driven organizations. Downey helps leaders, teams, executive directors, and boards with the critical task of clarifying an organization's sweet spot at the intersection of what it is good at, what its clients need, and the activities that get measurable and sustainable results.